Don’t you just wish someone can do your shopping for you? I know, I know. Shopping isn’t really a chore, so it’s nowhere near taxing. But there must be days when you feel lazy to shop, right? When you feel like you just don’t have the time, patience nor energy to browse through so much stuff? And then you realize you still need a new outfit to wear to that party so you power through it like the gladiator shopper that you are but end up missing the best items anyway because you’re in no mood to shop. This is where personalized shopping comes in. I’m sure you’re all familiar with the concept. A personal shopper chooses and even styles items for you. Think fairy godmother for shopping. It’s nothing new. A lot of stores actually offer this service already. But how about online personalized shopping with a twist? Introducing one of Singapore’s leading online fashion stores for women, Her Velvet Vase. It’s responsible for putting together this beautiful outfit I’m wearing based on my preference. 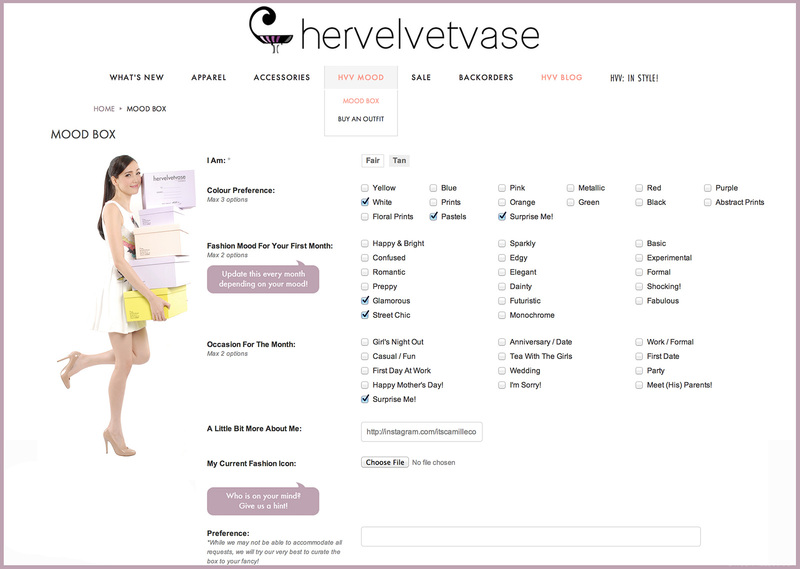 All I had to do was go on www.hervelvetvase.com, click on HVV Mood and purchased a Mood Box. If you’re wondering what an HVV Mood Box is, it’s a box that contains an outfit specially curated by Her Velvet Vase’ team of experts based on your mood, color preference, style, occasion and more. Cool right? It’s super simple to make one. Just choose the type of subscription you want and customize your box by answering a few questions. The form you see above is part of the actual form I sent. I had no clue what Her Velvet Vase was sending me so it felt a little exciting waiting for my Mood Box to arrive. When it finally arrived, I quickly opened my box and found all these goodies inside. I almost thought it was Christmas morning already! I got a leather jacket, a cropped top, a printed skirt, a metallic bag, a statement necklace, beauty products from Benefit and Philosophy, a cute strawberry measuring tape, a Benefit calendar, and Her Velvet Vase notebook and pens. That’s SGD100 (approximately USD80) worth of items for just SGD70 (approximately USD 60)! If I got the 6 months subscription instead of 3, then I would’ve gotten all these for just SGD60 (approximately USD 48)! Aside from being able to choose between 2 subscription options, you’re also free to choose among boxes worth SGD85 to SGD150. Shopping never felt easier! If you’re not really into surprised and simply want to shop Her Velvet Vase’ other designs and items, you can get 10% off by using my code “HVVXCAMILLE10OFF” upon checkout (because I love you like that and I’m a staunch supporter of easy-peasy shopping). Her Velvet Vase is also offering flat rate shipping via DHL to the Philippines at SGD 25 and guaranteed refund if the parcel is lost in transit. These special promotions are available until the end of September so hurry! Yay. I want to try this! I love surprises! maybe I should also sign up to that :) love the skirt! Hi Camille! Did DHL deliver the package at your doorstep or did you have to claim it in the Post Office? Did you pay for customs tax? Wow they are really good. Hey, i really wanted to shop on online websites but i don’t know how maybe you could shed light to some of my queries. Were the goods you buy online delivered to your doorsteps or you had to pick them in the customs? Thanks! Thank you Anne! I love them so much as well! 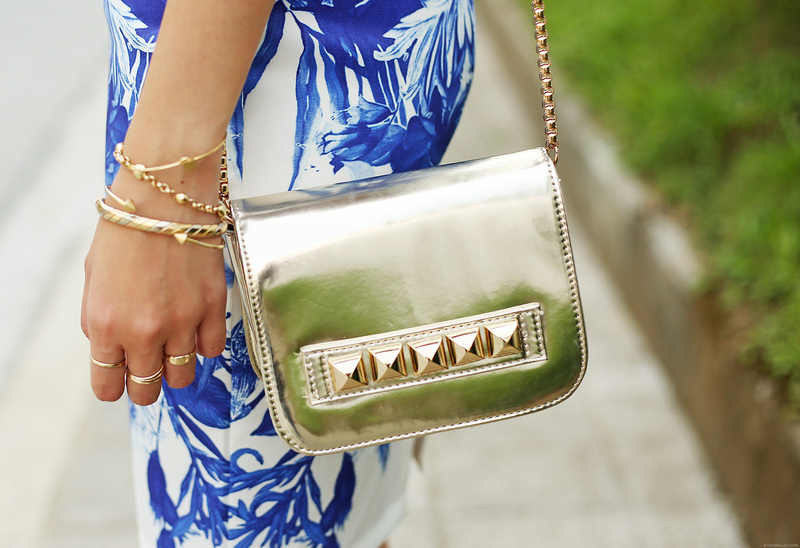 Sophisticated but still fun and pretty! Perfect skirt and I like that outfit.